Fayez El Helou is the Executive Director at Starmanship & Associates, a leading provider of professional training and development programs. He is specialized in sales, customer service, leadership and productivity training. With more than 22 years of experience in the training industry, Helou is a real resource and knows how to provide training solutions that foster the success of organizations and individuals. Transportation from the LAU Byblos lower gate will be provided at 12:00 pm. 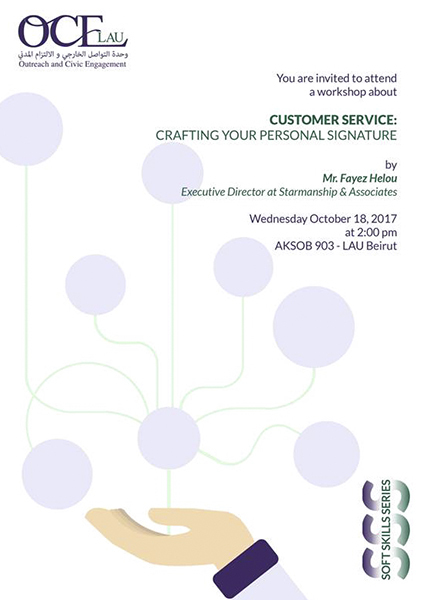 Return will be from the LAU Beirut lower gate at 3:30 pm. To attend, kindly register here preferably before the 16th of October 2017.